Tight semi-final series between Midland & Allenwood softball teams came to a climax when Allenwood took a 4-3 verdict to win the series 3-2. Allenwood will now meet Elmvale for the Georgian Bay title. Midland team members are, front row; Bill Yorke, Jim Johnson, Ted Brady, Jack Toole, Les Scott, George McFarlane. 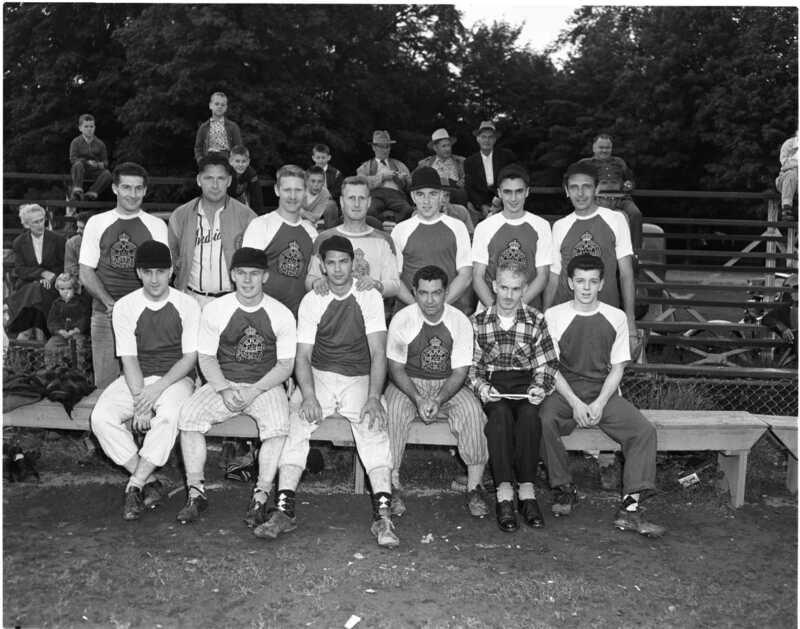 Back row; Connie Adams, Garnet Drinkle, Charlie Spiker, Jerry Borsa, Murray Yorke, Fred Hook and “Buck” Rogers. 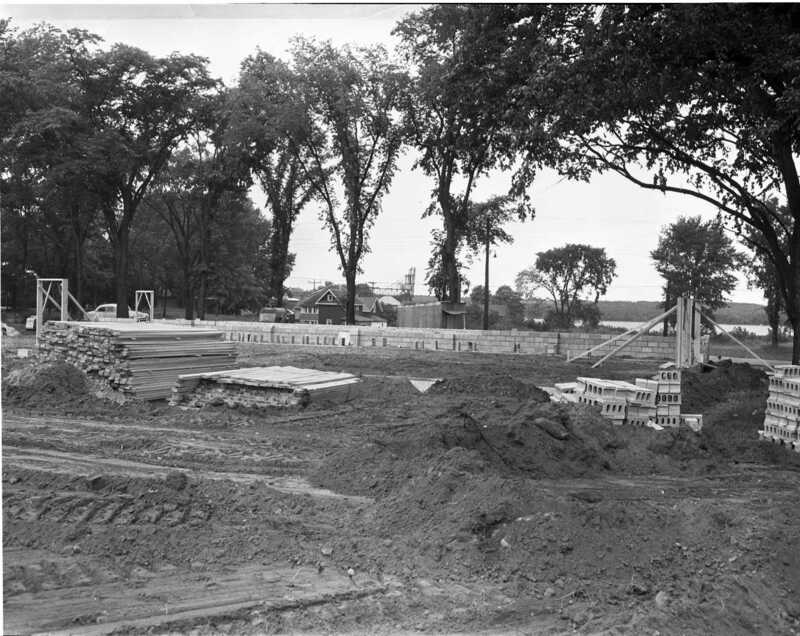 Foundation for Midland’s newest factory, Pinecrest Products, a manufacturer of unfinished furniture. The building is being constructed by Webster Smallwood of Midland and will have 8,000 square feet of space. 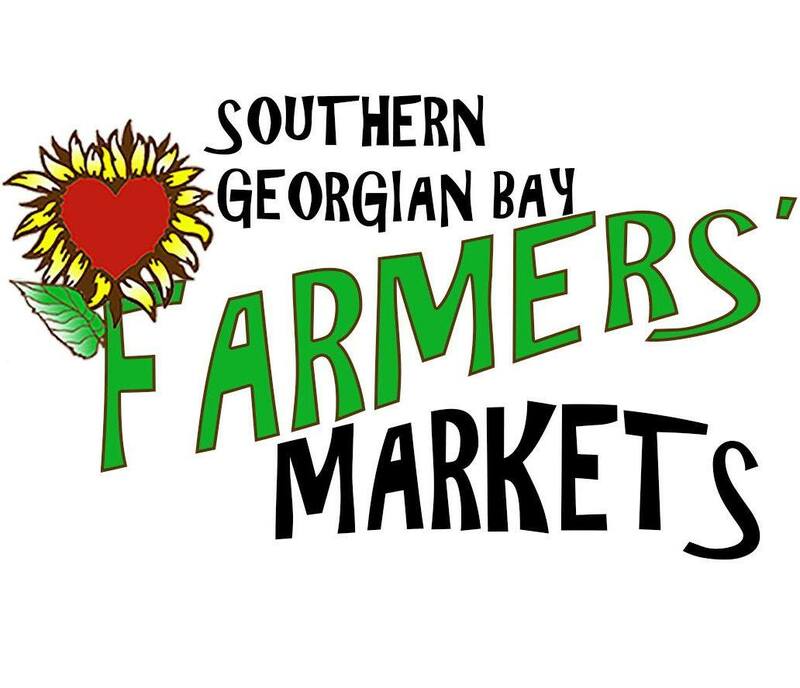 It is located on the south side of Bay Street between Olive and William and owned by Robert Holt. 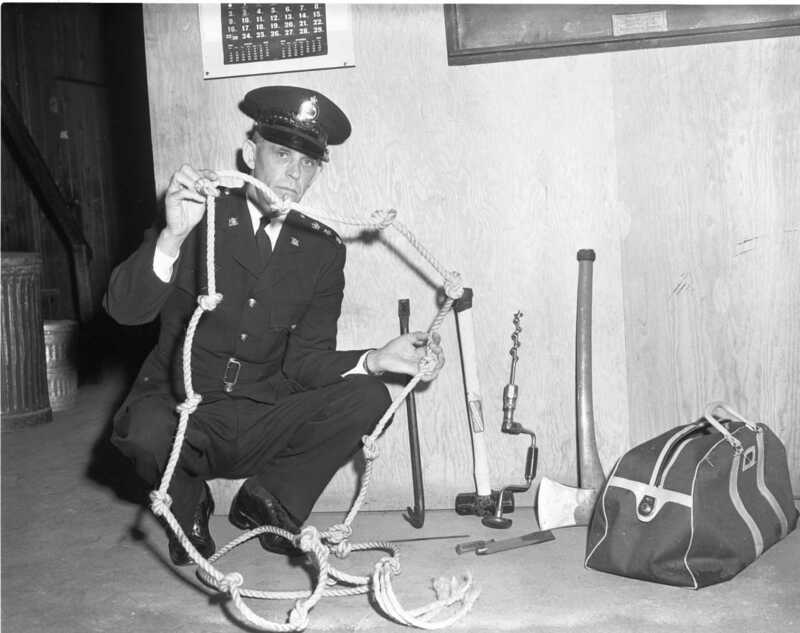 Burglary equipment found on the roof of Walker Store Ltd. on King Street is displayed by chief Constable Robert Cameron Monday after an unsuccessful break in attempt. Mrs. Annie Ridley is celebrating her 89th birthday at her home on Third Street in Port McNicoll Wednesday. 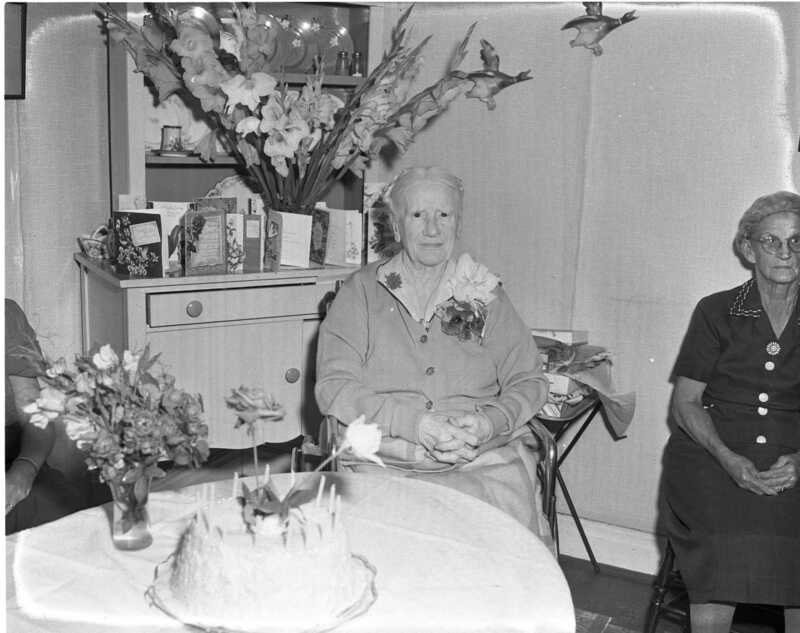 Born at Burton-on-Trent, England, Annie came to Canada as a girl of 12 and has lived in Port for the last 8 years. 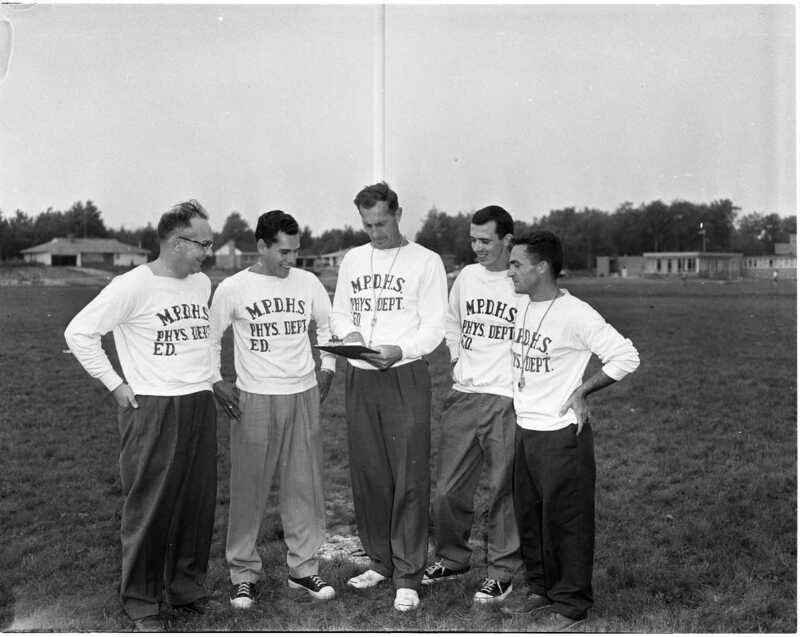 Five of the six men connected with boy’s athletics at the new MPDHS are pictured here. Bill Kennedy, assistant coach in charge of junior rugby; Doug Swales, head coach who pilots the senior teams; Bill Setterington, head of the physical education department; Tom Cavanagh, who is assisting the junior football program; Emile Blouin, track and field coach. Absent is Don Kenwell. 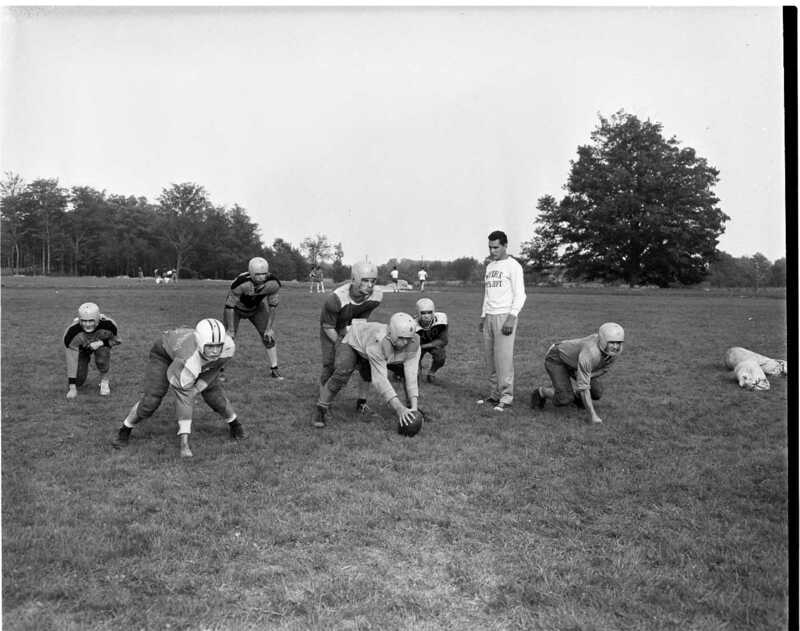 Football season is just around the corner at MPDHS and Doug Swales is seen watching the lads in the backfield during a practice. Bob McIntyre, Joe Huston, Ed Trudeau; back row, Jerome St. Amant, Frank Holmes, Vic Zabzinski. Quarterback is Connie Maurice. Hive of activity is this gravel pit filled with pieces of equipment just north of the overhead railroad bridge in Victoria Harbour. 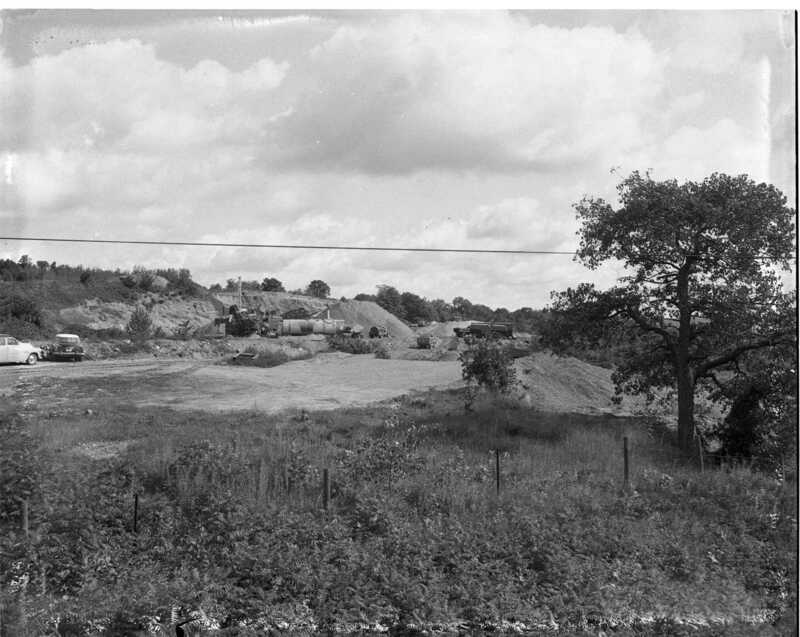 Operated by the Beamish Construction Company the pit is being used to supply the new surface to Highway 12 between Midland and Waubaushene. The work is nearly completed. 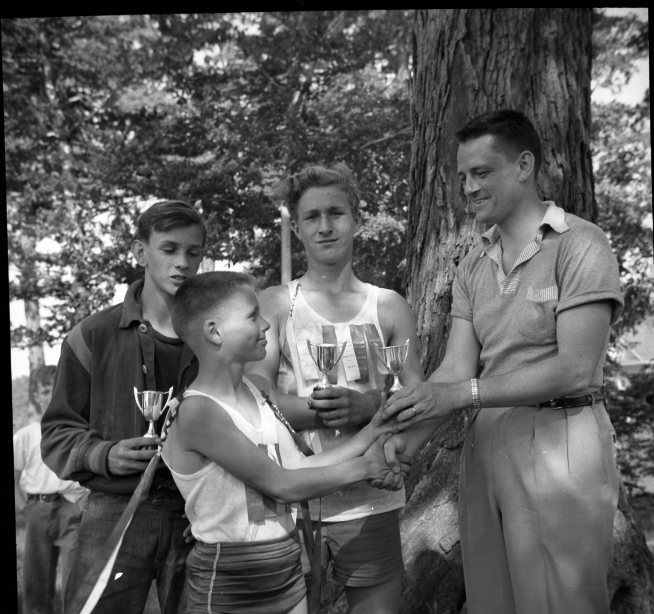 Bill Barnett handing trophies to three young boys who are also wearing ribbons on their gym shirts. Tom Tushingham center, Central School junior champ in the Midland Public School’s track and field meet. Paul Crawford grade eight at Regent School intermediate champ and John Koeing grade seven at Sixth Street, senior champ. Champions of the girls division of the Midland Public Schools track & field meet held at the town park. Joan Budarick , grade six at Central School and Elizabeth Swales Grade Six at Regent School tied for junior girls champ. 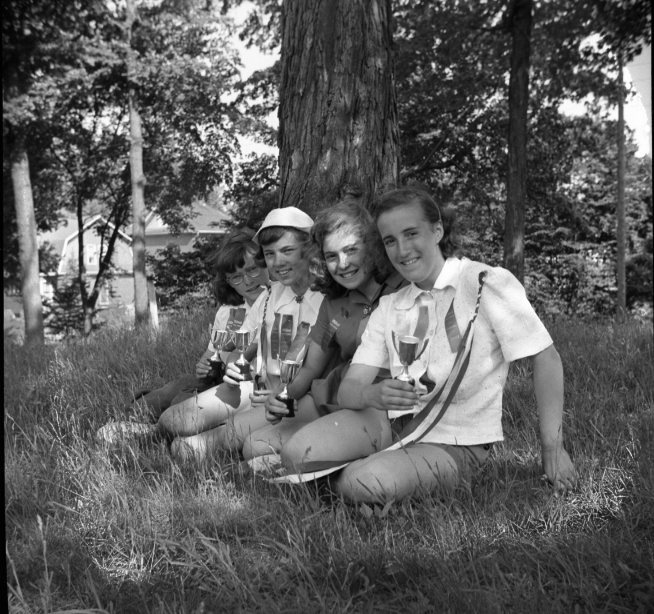 Carol Cowan grade eight at Sixth Street School, intermediate champ and Pat Fraser grade eight at Regent School, senior champ. All holding trophies and wearing award ribbons. TEN YEARS AGO 1946; The bell of the corvette “Midland” was presented to the town by the Department of Naval Affairs at a ceremony in the Arena Gardens. The bell was to rest in the town hall. — Henry Laroche, a 24 year old from Dosquit PQ, suffocated when he fell into the grain hold of the Bryn Barge while it was docked at the Simcoe Elevator. — Midland’s active service veterans from World War II were to be presented with wallets inscribed with “Presented by the Town of Midland to Veterans of World War II”. Presentation was to be made by mayor C. M. Vent at a civic reception in the Arena Gardens. — A valuable diary containing the story of this community and the people in it for a period of forty years was destroyed when the owner accidentally burned it while housecleaning. —- A 6400 series CNR steam engine , one of the most modern and mightiest, arrived from Toronto with an excursion for the Martyr’s Shrine. It was the first time one of the streamlined monarchs had ever been on local lines. —- Plans had been completed and tenders called for Midland’s new theatre by Toronto architect H. G. Drurr. The new theatre has been designed to seat 850 patrons and was to be entirely fireproof. Local firm, Allgerow Enterprises owned by George Gerow has been awarded a $41,500.00 plumbing contract for 100 houses being moved by the city of Hamilton from the downtown to a residential area. Ken Williams (May) set a new record for both male and female bowlers when she scored a 412 game in league competition, 12 more than the previous record set by Mrs. Bruce Spicer (Dorothy) last year. The men’s best is a 407 bowled by Ross Cioe. A perfect game is 450. Tiny Township police chief Raymond Belcourt reports that a cottage was broken into and the only thing stolen was the toilet. Advertisement for Romey’s Grill, 231 King Street. Seventeen schools march in Coldwater’s Huronia Fair parade. Fourteen were one room schools. The Free Press in 1956 is still very much geared to the local farmers. Article in the paper urges growers to watch out for “ring rot” in your potato crops. Simcoe County CAS has 449 wards currently in their care, in boarding homes, on adoption probation, in wage or free homes, at Ontario hospitals, training schools and elsewhere. Canadian Nameplate posts a half page letter explaining its position in the contract negotiations with its unionized work force. Article on the history of the R.C. Church in Honey Harbour states that services dated from 1878 when Jesuit priests came from Manitoulin Island once or twice a year. The first recorded baptism was Christina Lalonde in 1868. The first church ws built in 1909 by Father Cabot, S. J. with organ, prayer books and pews provided by Father Barcelo of Midland. The mayors of Midland & Penetanguishene proclaim the week of September 24, 1956 to September 29, 1956 officially as Community Concert Week. Ontario’s Attorney General’s Office has ordered that sellers of used cars must provide a certificate of mechanical fitness to purchasers. The first Canadian census was taken in 1666 and showed 3,215 inhabitants exclusive of first peoples. D. L. Nicholls Funeral Home announcement that during enlargement and renovation of their facility, funerals will be conducted from the former R. E. Simpson & Sons Funeral Parlour, entrance off Elizabeth Street. Many advertisements in the paper for merchants showing at the Fall Fair, inviting people to visit their booths.